Dr Annie McAuley is a self-proclaimed tech mumtrepreneur! Through sheer necessity she created the innovative TalkiPlay to engage her youngest child in early speech development through interactive play. She applied her biomedical PhD research skills with her own experience of language loss following an earlier traumatic brain injury. Below Annie writes a message to her young daughter, and shares the many lessons she’s learned from the adventure in the USA with SheStarts. I sit here ready to take the stage to talk, focusing hard to take it all in. But I see your cheeky smile and I refocus. Your spark started this journey, an idea to get you talking – making our whole house talk, just like a Disney movie – we made the impossible possible with technology. The strongest why I could ever have. Because I didn’t want anything to stand in the way of you being your best self. Because I love you. Never in my wildest dreams did I think I’d be a technology entrepreneur. But now we’re both in Sydney at a huge Google event and I’m recognised as a female founder of a tech startup. 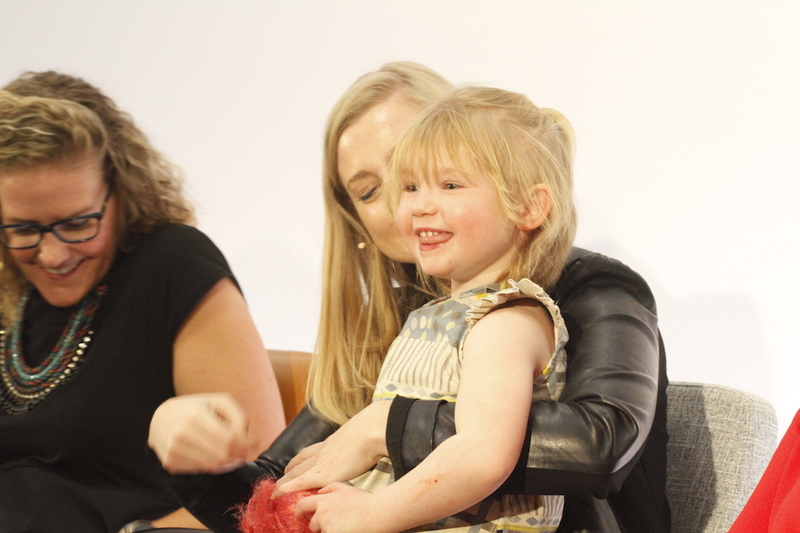 Little Grace saying hi at the Google For Entrepreneurs event where Dr Annie spoke about being a woman in tech. My participation with the Google for Entrepreneurs event stemmed from my recent trip to the USA with SheStarts. Together with other leading female founders at SheStarts from Australia, we had doors opened to the core of the biggest tech companies in the world. We traveled to New York City, the city of women where female-led businesses thrive. And then we went to the tech capital of the world, San Francisco, where the towers of tech (in particular the Salesforce tower) can be seen throughout the city. Just as the finance business ruled in our recent history, now tech is the leading empire of business. And I for this moment in history I am a part of it. I expect there’s going to be a rise of tech-mumtrepreneurs, like me, there are many women qualified to run a tech-based business which solves needs for children and parents. Dr Annie’s daughter, Grace, with TalkiPlay devices which create a talking house! Our learnings during parenthood are vital to creating products myself, other parents and children need. Our impact will change the future landscape of technology for the better and create great business for the global economy. Companies around the world are beginning to realise the benefits of supporting parents too. Workplaces like BlueChilli offer flexible working hours and conditions where parents can work from home when they’re needed there. Google has baby-friendly startup programs for mums and dads. These parenting options aren’t just to help women ease back into the workforce, they’re good for business. But why does creating spaces for parents matter? It’s because when people feel valued for who they are they step up. When people feel accepted, they’re more willing to bring their whole self to work. When we met Nisha Dua from BBG Ventures, she educated us that women (often mums) hold the highest spending power in countries like the USA & Australia, and are often early adopters of tech. If you’re in business, you need to employ people who understand mums, or who are mums. Visiting LinkedIn in San Francisco, we were encouraged to use our unique skills, no matter where we learned them, to provide value. And many of our transferable skills come from parenthood. I wonder if our parent-training is our superpower for business. To make the world sit up and listen to us, we need to spotlight the faces of future tech innovation in Australia to show the value from the learnings of parenthood in business. We need to hero the parents more often to demonstrate why it’s important to include us, why it’s important to create ecosystems that attract our talent and nurture opportunities to grow, and why equality in tech is just good business. Reflecting on rushing to get you from childcare, I’m reminded that 1) I really need to find more time to work out and get fit and, 2) I feel like I never have enough time and I am always rushing. Often I pat your head while you sleep and I wish I could wake you and tell you I love you one more time, that life wasn’t supposed to be a rush, life is full of fun and wonder. And just when I think your eyes are opening, I hold my breath, because I actually want you to be asleep – I need to do the washing and have a proper chat with your Dad. Not everyday is like that of course, but too many are. I long for the times we play together. Those are the small moments I live for. When I get to play again, when I feel happy & present. We know play is vital for kids, but is it valuable for parents? I’ve been re-learning how to play as you grow. It’s only through play that we take risks, experiment, pivot and re-try. Even in those early days as a parent I was a natural scientist. Our first Play Doh recipes were a disaster and I felt bad because I wanted to be that perfect Mum who knew how to make it and did all the craft projects. But maybe not being perfect was the blessing. It’s because I didn’t know how – that’s when we learnt together. It’s because I didn’t get it right – that you witnessed how to experiment and try again. And it’s what makes me not only an involved parent, but a great scientific innovator. So I’m wondering, how does this benefit me being innovative in my career? And what does it look like in the workplace, and should we be making more time for it? I believe we should be hiring people who can play, and that the skill will make them resilient, creative and capable for innovation. By this logic, us parents spending hours/days/years playing, that this skill of ours should be highly sort after in the business sector. My time playing in the park on the weekend, in the dollhouse, climbing trees battling dragons, flying food planes – that’s upskilling me!! 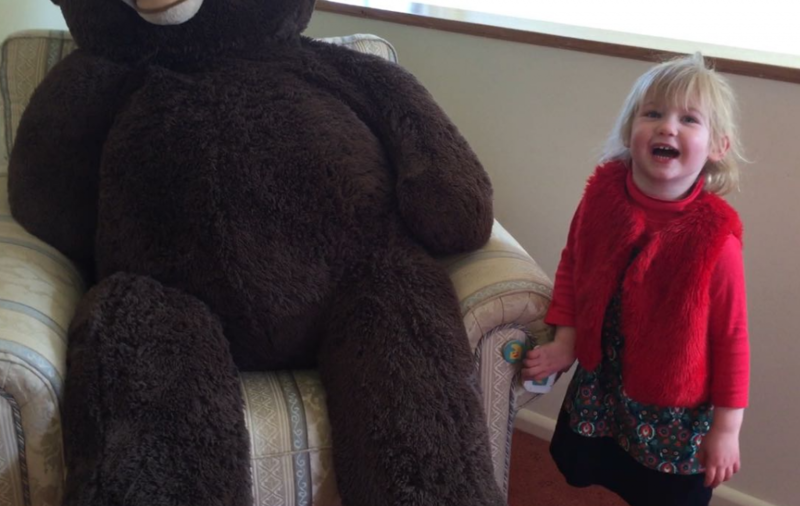 Dr Annie’s two kids – her why for creating TalkiPlay to help other kids with language development through play. Well, I’m going to tell you a new bedtime story tomorrow. 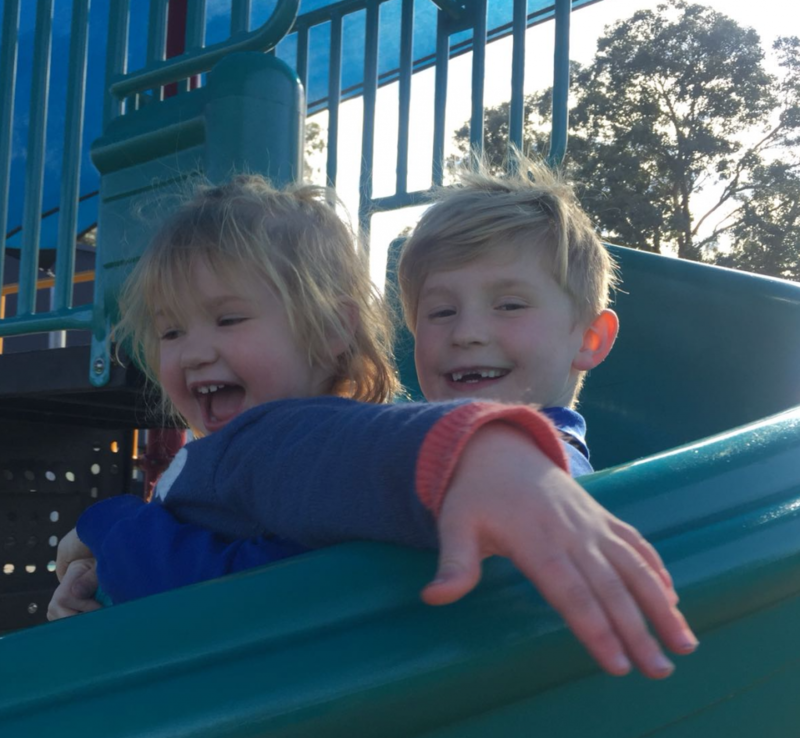 One about mums and dads, making discoveries in their own house, the local park and backyard. About how they changed the world with the power of play. Because we are never to old to make time to play. And we are the next generation of world changers because of you. You are our reason why. And we are valuable. So tomorrow I’m not going to rush, I’m going to value my time. And my time spent with you to just play. 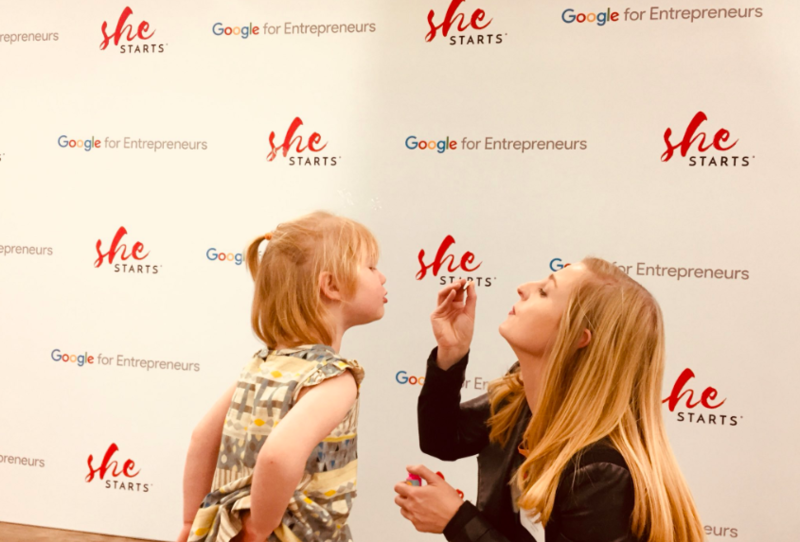 Dr Annie McAuley blowing bubbles with her daughter Grace at the Google For Entrepreneurs event in Sydney.